As we reported in our last program, slavery supporters failed to push through Congress a bill to make Kansas a slave state. Congress, instead, let the people of Kansas vote on the statehood constitution written by pro-slavery men. The people rejected the constitution. And slavery supporters gave up the fight for Kansas. Here are Steve Ember and Bob Doughty to continue the story. The problem of slavery continued to divide the North and South. Northerners warned that slavery could spread no farther. Southerners threatened to leave the Union unless southern rights were protected. In the far West, one could forget this bitter dispute. There were no slaves in the West. The land and the weather were not right for the kind of farming that used slaves. The west was growing quickly. Gold had brought thousands of settlers to California ten years earlier. New discoveries of gold and silver now were leading men to Colorado, Arizona and Nevada. "Don't go," warned the New York Tribune, "if you have a job or a farm. But if you have neither," it said, "and can get fifty dollars, then go to Colorado." There were many men without jobs or farms in the summer of eighteen-fifty-eight. The country had suffered a serious economic depression the year before, and jobs were difficult to find. Thousands left cities in the east. The first ones to reach Colorado reported that gold was easy to find. They said any man who worked hard could find five to ten dollars worth of gold a day, and sometimes even more. The thousands who rushed to Colorado soon found that there was not as much gold as expected. The valuable metal became harder to find. No longer could it be washed from the bottoms of mountain streams. Men had to dig into the mountains of rock to get it. Huge digging machines and crushers were needed to get the gold from the rock. These machines were expensive. Few men had enough money to buy them. Some of the miners organized companies. They borrowed money from eastern banks or sold shares of their companies. In a few years, almost all of the gold from Colorado came from the mining companies. Many of those who went west to search for gold stayed to become farmers or storekeepers. Others moved farther west to find gold in Nevada or California. Some cleared the ground of trees and cut them into wood for houses. Such timber from the forests of Oregon and Washington was sold in California and Mexico, even in China and Hawaii. A few men recognized the need for transportation across the nation. Engineers planned four railroads. But northern and southern leaders could not agree on which one to build first. 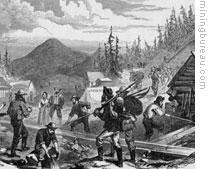 Until a railroad could be built, supplies were carried west in wagons pulled by horses or oxen. Three men -- Russell, Majors, and Waddell -- formed a transportation company in eighteen fifty-five to carry government supplies to soldiers in the West. They started with five hundred wagons. Three years later, the company had three thousand five hundred wagons and forty thousand oxen. Getting letters to and from the west was not easy in the eighteen fifties. Ships brought mail to San Francisco two times a month. And once each month, mail would arrive in California after a slow trip by wagon from Saint Louis, Missouri. The federal government decided to send mail overland two times a week to California. It gave the job of carrying the letters to a new company -- the Overland Mail Company. The mail was carried by train or boat to St. Louis. Then it was put on overland company stage coaches -- light wagons pulled by four or six horses. The company was told to take the mail along a four-thousand-kilometer southern route through Arkansas, Texas, New Mexico and Arizona. The mail arrived in Los Angeles twenty-four days after it left St. Louis. There was a shorter way across the country. But the postal chief was a southerner, A. V. Brown. He believed stage coach travel might lead the way for a railroad. And he wanted a southern railroad to California. Brown said the southern route was the only one that could be kept open in all seasons. He said the other routes would be closed by snow in winter. The overland stage coaches were large enough to carry four passengers. But not many people went to California in the coaches. The coaches never stopped for very long -- only to change horses or drivers. And there were not many places to eat. Also, the trip was dangerous, because of hostile Indians. The shortest distance between Missouri and California was across the central part of the country. The Russell, Majors and Waddell Company decided to show that this central route could be used all year. It began a speedy mail service called the Pony Express. Letters were carried by riders on fast horses. Stations with fresh horses were built about twenty-four kilometers apart, all along the way. A rider would change horses at each station until he had traveled one hundred twenty kilometers. Then he would give his letters to another rider. In this way, the letters would be carried between California and Missouri. The first letters sent by Pony Express from California took ten days to reach Missouri. 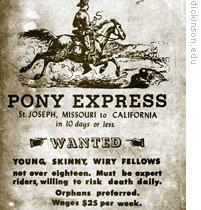 The Pony Express lasted only eighteen months. It was no longer needed after a telegraph line was completed to San Francisco. As communications and transportation improved, the government was able to increase its control over the West. But closer ties were not welcomed between the government and a religious group known as the Mormons. 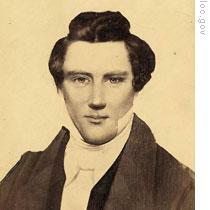 The Mormon religion was started by a young New England man named Joseph Smith. In eighteen-twenty-three, at the age of eighteen, Smith claimed that an Angel told him of a golden book. He said the book contained God's words to the ancient people of America. Smith said he was able to read the strange writing in this book and put it into English. He called this work the Book of Mormon. He organized a church and made himself its leader. Many people became Mormons. They believed themselves to be a special people chosen by God. Mormons worked hard. They helped each other and shared with those in need. People who did not agree with the beliefs of the Mormons did not like them. Trouble developed between Mormons and other people. Joseph Smith was forced to move his people from New York to Ohio and then to Missouri. The Mormons seemed finally to have found a home in Illinois. They built their own town and called it Nauvoo. They governed themselves and had their own defense force. The Mormons did so well that Nauvoo became the fastest-growing city in Illinois. Then some members of the group split apart, because of a new message Smith claimed to have received from God. Smith said God gave permission for Mormons to have more than one wife. This was polygamy. And it was opposed by almost all people. Some of the Mormons who left the church published a newspaper criticizing Smith and the other Mormon leaders. Followers ordered by Smith destroyed the newspaper's publishing equipment. This caused non-Mormons to demonstrate and demand that Smith be punished. Smith was arrested and put in jail in Carthage, Illinois. His brother also was arrested. An angry mob attacked the jail and shot both Smith and his brother to death. The governor of Illinois ordered the Mormons to leave his state. He said only this would prevent further violence. There was no choice. They had to leave. 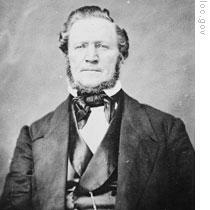 The Mormons had a new leader: Brigham Young. Young decided to take his people west and find a new home for them. He wanted a place where they would be safe -- where no one could interfere with their religion. Brigham Young told his people that he had seen their new home in a dream. He said they would search for it in the West, for a wide beautiful valley. He said he would recognize it when he saw it. Our program was written by Frank Beardsley. The narrators were Steve Ember and Bob Doughty. Transcripts, MP3s and podcasts of our programs are online, along with historical images, at www.unsv.com. Join us again next week for THE MAKING OF A NATION - an American history series in VOA Special English.